You can help me raise water purity standards on your local beach in 2014 by simply taking photos when you are on the beach during the year. To obtain the highest standards of water purity on our local beaches, they must be recognised as ‘Bathing Waters’ under the EU directive. The rules say that we need to back applications with photos showing the beaches are used for walking, bathing and family outings. Only photographs from this year’s bathing water season onwards can be considered. There have to be a minimum of 45 bathers on one occasion or 100 beach users on two occasions. 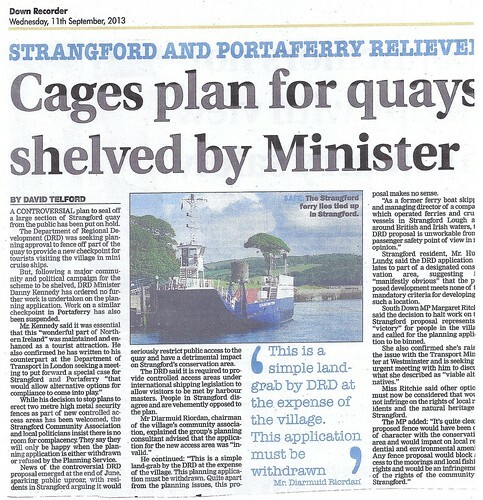 This campaign goes back to the downgrading of the new Ardglass sewage scheme in April 2013. NI Water announced the scheme with media fanfare. But then feigned surprise when I raised hell over the fact they had shelved the original plan to include Killough, Coney Island, Chapeltown and Ballyhornan. 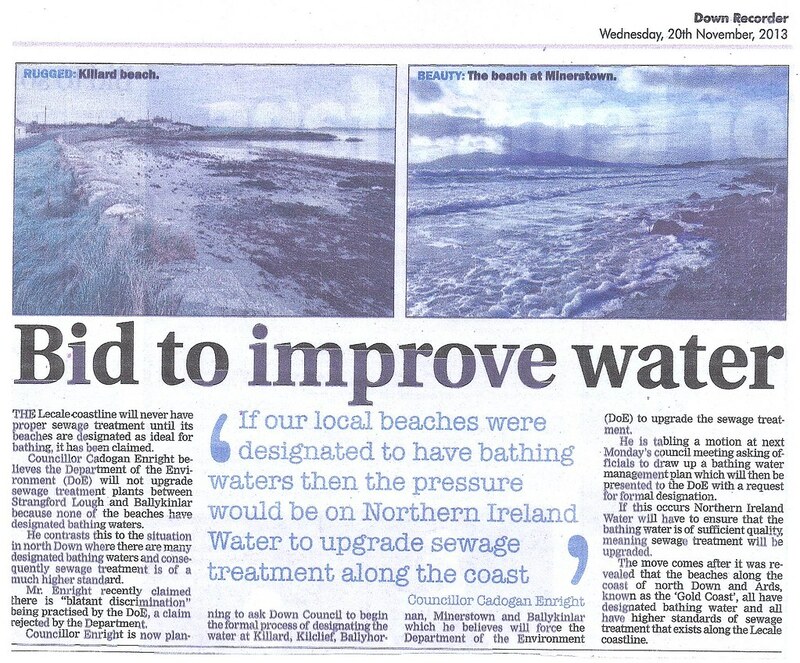 This damages the development, tourism, health and safety of the Lecale Coast. 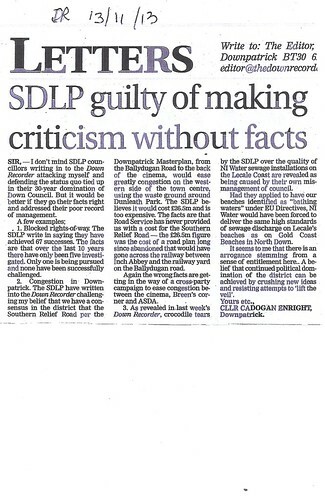 For 6 months I challenged NIWater to explain why all towns on the ‘Gold Coast’ in North Down had top-level sewerage treatment, but low standards were acceptable on the Lecale Coast. I was finally told, “There are a number of bathing waters identified under the Bathing Water Directive along the Gold Coast. These include Helen’s Bay, Crawfordsburn, Ballyholme, Groomsport and Millisle. There are currently no designated bathing waters along the Lecale Coast.”. 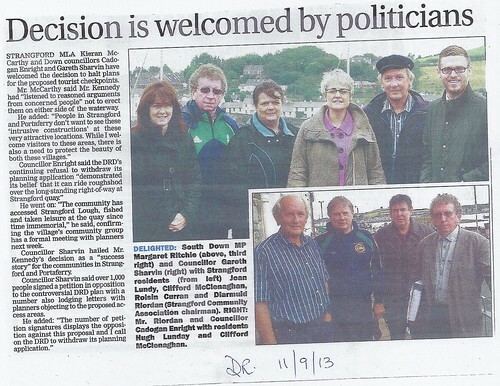 (NIEA obviously don’t know Tyrella and Murlough are in Lecale – which do have EU recognition). 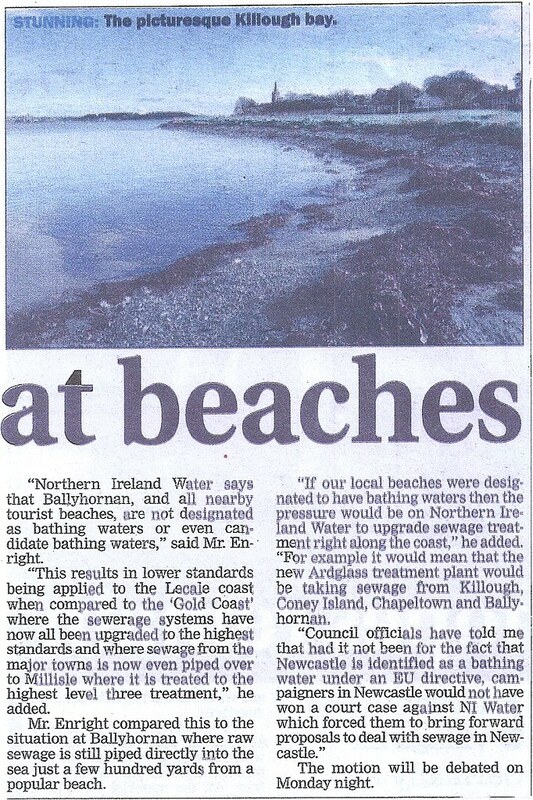 It’s not unfair to say that the NI Environmental Agency are discriminating against Lecale by not designating our beaches as ‘Bathing Waters’ but designating all the main beaches in North Down. 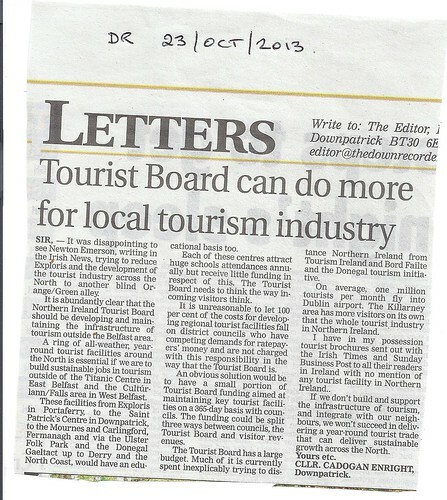 The tourist industry is essential here, we are entitled to the same sewerage standards as residents in North Down. In the process of this campaign, I discovered that anyone can apply to the EU directly and get a beach recognised. 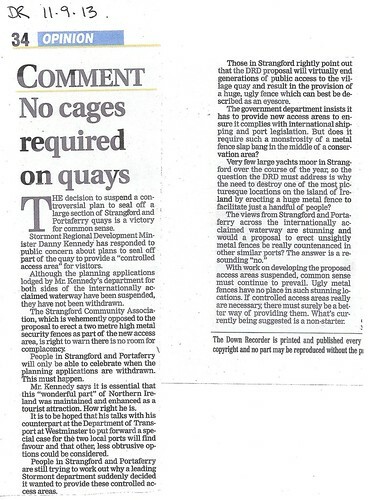 Thus, in December, I had a motion passed in Council, requiring Council Management to prepare a list of candidate beaches under the Directive including Kilclief, Killard, Ballyhornan, Coney Island, Killough and Minerstown. Each beach will be separately assessed, and the council will be deciding on which to progress first in the coming months. 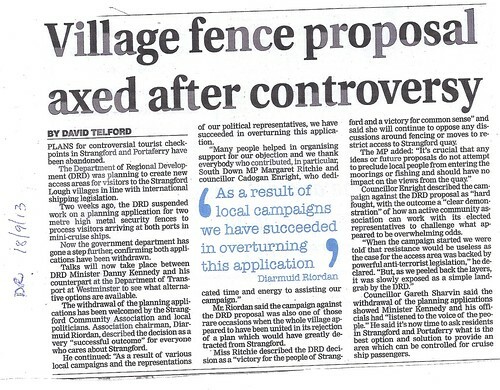 If this campaign is successful then we can force NI Water to reassess its downgrading of sewage treatment in Lecale. If you or your family can organise a beach party for 45 people ( I am!) then email, facebook or post them to me as part of this campaign and lets bring Gold Coast benefits to the Lecale Coast. Oct 23 2013 Touist Board and Local tourism industry, a photo by CadoganEnright on Flickr. 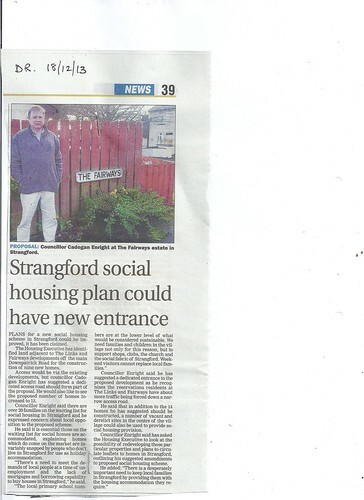 The vigorous campaign waged by the Strangford Residents Association supported by Cllr Cadogan Enright scores a significant win on the road to victory.